Command the most dangerous soldiers in the universe! In Deadzone, you lead an elite squad of soldiers within the confines of an urban battlezone and engage your opposition in furious fire-fights. Featuring stunningly detailed miniatures and amazing modular scenery, Deadzone puts you in the centre of exciting battles with variable mission objectives: capture enemy intelligence, assassinate the enemy leader... eliminate the opposing forces! Deadzone features two crack teams of upgradeable troopers complete with powerful heroes and devastating heavy weapons. The Enforcers are humanity's most elite soldiers, each one a clinical, methodical instrument of destruction. Standing against them are The Plague; mutated combat monstrosities that attack in waves, spreading panic and fear as they terrorize the enemy. 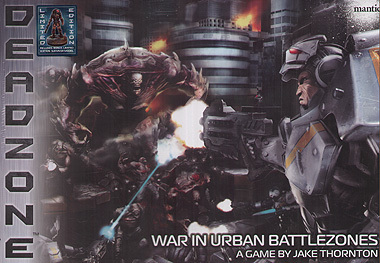 These two forces, depicted as stunning miniatures on the tabletop, fight in an urban warzone created using the high quality game mat and versatile building tiles and accessories included in the box. These are fully modular and can be built in any combination you desire, the only limit being your imagination. With simple rules that offer tactical and strategic gameplay and all of the cards and counters required for playing the game, this box contains everything you need to become the commander of your own elite Deadzone Squad and wage war across an Urban Battlefield. Will you survive contact with the enemy? 2 Plague Stage 3D "Hellhounds"
Models supplied unpainted. Glue and paint not included.